Which Storage Product Are You Using? Post a message to the LBackup discussion mailing list and share which storage system you are using with LBackup. If your backup sets are not going to keep expanding, then a range of online and offline storage solutions which may meet your requirements such traditional RIAD devices, single HDD / SSD enclosures are on offer from various vendors. Contact Lucid to discuss (with us or one of our affiliate consolation partners in your region) storage enclosures, traditional hardware RAID, SoftRAID and also file systems such as, HFS+J, ext4, ZFS, btrfs and many more which may be of use to you with regards backup of your important data. We are also ready to assist with establishing a backup policy. If you require assistance with powering storage systems in data centres or single drives in remote locations, Lucid has the expertise to assist you with your projects. Within New Zealand and Austrilia Lucid a wide range of offers solar and battery solutions. In the event that you are dealing with expanding data and are looking for a storage system which easily scales, then a Drobo may be worth considering. Provided your individual LBackup backup set(s) require less than 16TB of disk usage, a Drobo storage solution may mean that you will not require a SAN for your LBackup disk to disk backup sets. One key feature of Drobo storage solutions is the ability to mix drive makes, models and sizes. Another key feature is the Drobo allows you to incrementally add larger drives as more storage is required. In some situations this approach allows you to reduce your up front costs and life time costs for a storage set. If you are using a Drobo with LBackup, then it is recommended that you configure the partition so that it is smaller than the usable space on the unit. This way when there is no disk space the backup will stop and report an error rather than making the system very slow. Details regarding JHFS+ partition resizing are available from the filesystem resizing page. Resizing the file system on a Drobo is not officially supported. Ensure that you have a back up of all data on a Drobo before resizing the file system. For example, if you estimate that you will initially require only 2TB of storage, then you can purchase hard drives to achieve this capacity. Then as your backup set storage requirements increase to 3TB, you can add larger drives or additional to increase your storage capacity. Hopefully, enough time will have passed so that the price for the higher destiny disks or additional similar density disks will have dropped. Essentially, Drobo storage solutions allow you to gradually increase your storage capacity as required, without the need to migrate your backup sets to a new volume. If you would prefer to use the thin provisioning of the Drobo and keep the system in a state fully supported by Drobo Inc and need assistance with configuring alert systems for when to add additional drives into the Drobo (well before the system starts becoming slow) then contact us. Another approach is to utilise disk images to limit the available storage for the backup(s). LBackup's scripting sub-systems make setting up backup to a disk image on local media or via a networked file system as simple as possible with initialization_scripts. Another key feature of Drobo storage solutions is the ability to remove all the disks from the unit and then routinely rotate these disks with another set(s). The other set(s) may be stored of site. In addition, the price of the Drobo means that it is feasible in some situations to purchase a set of Drobo units which may be rotated on and off site on a routine bases. Finally, the DroboPro supports iSCSI. Essentially, this means that that it is possible connect the storage device(s) to your server via ethernet switches. 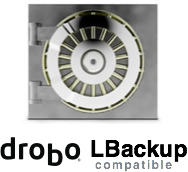 This means that it is not only possible to attach multiple DroboPro devices to your server, but it also means it is possible to have the storage and the servers a reasonable distance apart. In a data center, this means that it is trivial to place storage devices on one side of the server room and the servers which are connected via iSCSI to these storage resources on the other side of the server room or down the corridor with out the need turn to fiber. As a result, you can easily assign physical access rights to one set of people who have the ability to swap out the storage disks. However, you have the option of easily restricting access to the servers and server consoles. In conclusion the group of people who are granted physical access to the server(s) console(s) may may be more easily controlled. Many of the Promise Technology Inc RAID products are great options for hosting your LBackup data sets.